When you think of Rio, you think sunny beautiful weather, great beaches, tiny bikinis and wild Carnival… all of the above are true except for the beautiful weather at least since I arrived (apparently every day before it was ‘sunny beautiful weather’. Well, no matter what the weather is people are on the streets in costumes from sunrise to sundown! 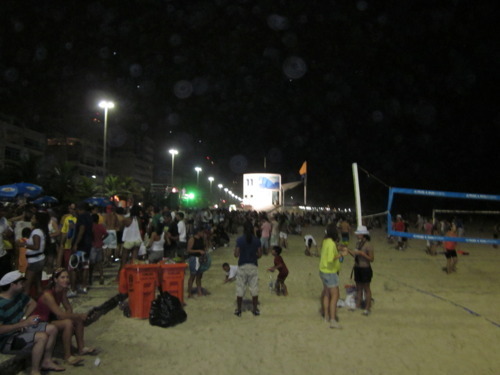 Before the rain started up again, we headed over to the beach ‘block party’ in Leblon last night. 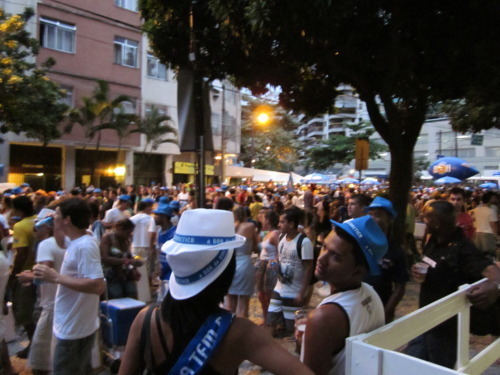 The float (shown below) was the start of last nights festivities and all of those blue umbrellas you see— beer stands! 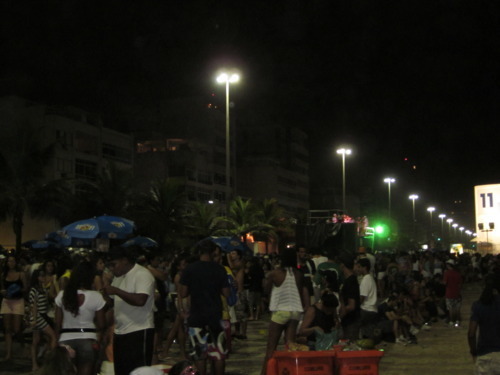 They shut down the main road on the beach (ie- lot more space and less crowding; which made it very easy to maneuver, unlike the one ON our street) and it was fun to see the party spilling on to the beach. As you can see from the pic (below) it started raining… no one stopped singing, or looked for an umbrella. It really is non stop for 7 days here! Most people have some sort of a costume on as you can see (see pic), there are people handing out hats, and of course everyone is drinking beers We made our way around the ‘loop’ a few times, got a pic from our roof— so as you can see it is literally happening right below us! 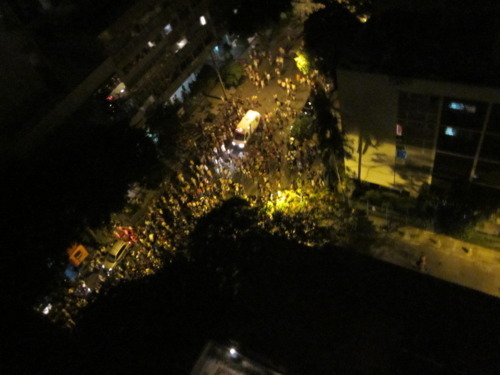 After the block party all of the bars have people pouring into the streets, continuing the Carnival celebration. 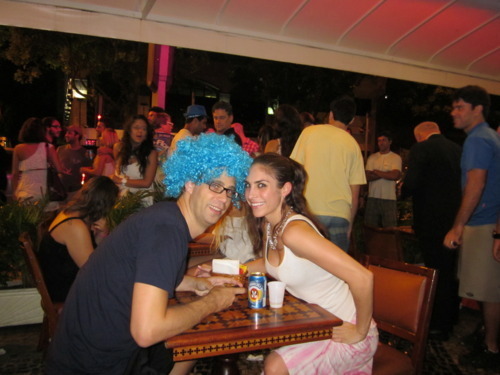 This is at Pizzaria Guanabara (fact that we were able to actually sit for a second was a miracle! 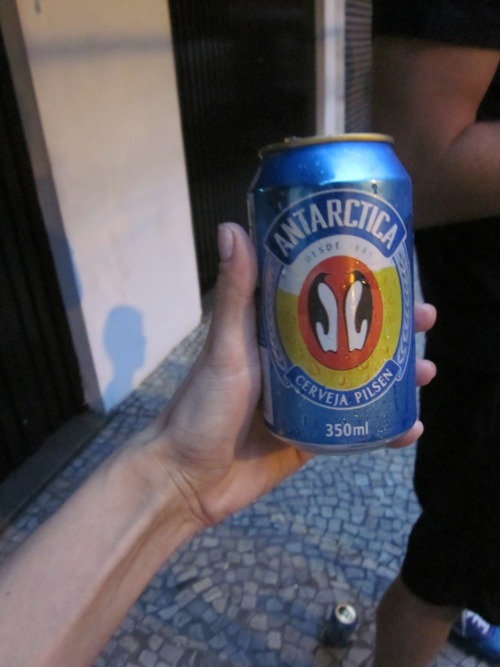 We made a bunch of other stops along the way including: Bibi, Bar da Praia (amazing caipirinha w/ fresh strawberries and red bull! ), a few I can’t remember the names of and then an attempt and Boox (one of the nicer clubs) but apparently you can’t be in flip flops and must wear a shirt…..
More Carnival adventures to come…. this was supposedly one of the more ‘low key’ nights!